Could you keep index consistency about sensors? If I use a GPU that has less sensors, the index is then not correct. For instance, all GPU will have temp sensor and so for 3 GPU, that will be 1,2,3. But if my GPU 2 (mining gtx 1060, P106-100), the other sensors for the GPU 3 will be indicated on GPU index 2. Attaching a picture that shows the issue. Note: To workaround this issue, i will move the mining gpu card to position 3. This is not working as windows shuffles around the position. 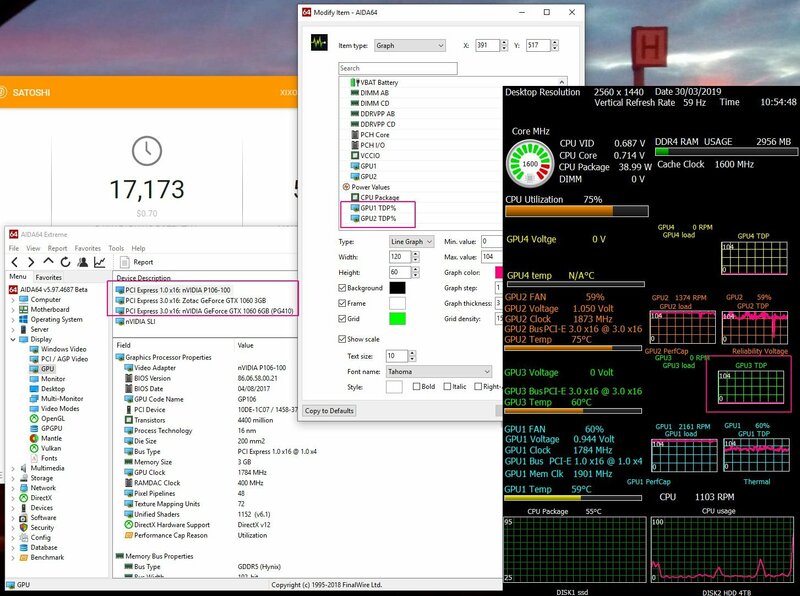 Note that gpuz and MSI afterburner recognize the sensors. 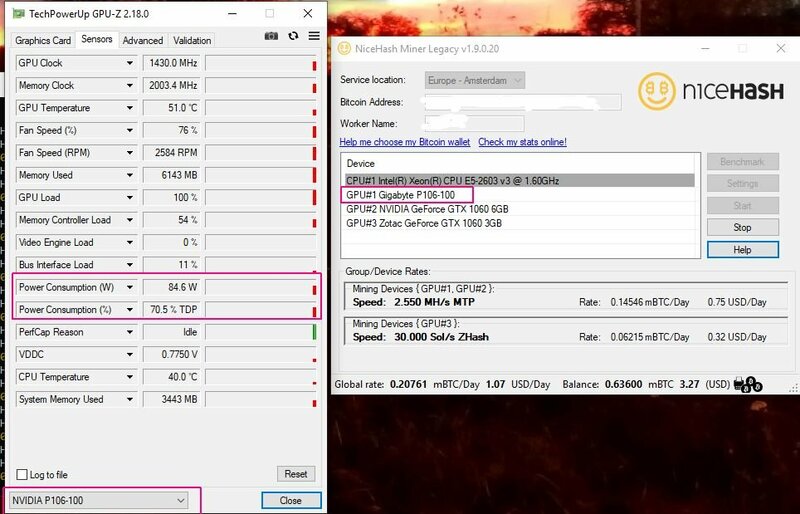 Could you add the sensor readout in aida64 for that gpu miner card? DMI MB Manufacturer : Gigabyte Technology Co., Ltd.
DMI SYS Manufacturer: Gigabyte Technology Co., Ltd.
0000 00 00 00 04 00 00 00 00 00 24 25 15 02 25 12 18 .........$%..%..
0010 00 00 08 0D F4 1B 00 00 6C 6C 6C 11 08 74 20 08 ........lll..t .
0020 00 05 70 03 00 A8 1E 2B 2B 00 78 00 14 3C 00 00 ..p....++.x..<..
0040 16 36 16 36 00 00 16 36 16 36 16 36 16 36 00 00 .6.6...6.6.6.6.. Fiery, Could you support that sensor? I don't think the sensors are assigned incorrectly across the cards. What may be the problem is if AIDA64 uses a different indexing order for your 3 GPUs than other software or the physical order of your video cards. AIDA64 uses the order that is dictated by the PCI device ordering on the PCI bus. Could you add sensor support for that card? Have you read my response? The issue is not about supporting one or more of the video cards (BTW, they're already supported), but the way AIDA64 indexes and orders them. the giqabyte looks not supported. It means at the time AIDA64 started up, it could detect 2 video adapters in your system. "Video adapters" as a technical term in this case includes mining adapters and nVIDIA Tesla accelerators as well. However, in case your mining card was sleeping while AIDA64 was starting up, it could well be invisible on the PCI bus and so not picked up by the GPU detection module of AIDA64. You can try to enable Wake GPUs up at AIDA64 startup in AIDA64 / main menu / File / Preferences / Stability in order to make sure all video cards and mining adapters are "nudged" by AIDA64 at its startup before the actual GPU detection is performed. Please let me know if it helps. I'm not sure if I understand the current state of the issue, so please clarify: after enabling the GPU waking option, all your GPUs are picked up by the PCI device enumerator of AIDA64, but you still don't have all 3 GPUs listed properly on the Display / GPU page of AIDA64? Well, all 3 gpu are present but some sensor like TPD are missing. My best guess is that for some reason ForceWare decides to put one of your non-primary GPUs to sleep, and then fails to report any measurements for the sleeping GPU. the sensors are still missing. GPUZ properly shows the TPD sensor of that special mining card. This is really puzzling... The issue must be related to the kind of card you've got (that it's a mining adapter and not a video adapter). We've ordered an Asus Mining-P106-6G board to try and replicate the issue here and dig down deeper. I apologize for the delays in fixing this issue. I'll update you in this topic once we've got the mining card.